Left Focus: What are the Strengths and Weaknesses of both the Candidates for the ALP leadership? What are the Strengths and Weaknesses of both the Candidates for the ALP leadership? In the first televised leader aspirants debate Albanese talked about “big ideas” and big infrastructure projects. Judging from Albanese’s past statements, this could mean anything from preparing for fast rail to finishing the National Broadband Network. Both Albanese and Shorten made reference to the rights of aged care workers – the improvement of their conditions being crucial in holding on to skilled staff in an important and highly demanding sector. Albanese also talked of addressing the quality of life of residents in Aged Care, and Shorten suggested “new instruments” to fund aged care services. But because both candidates were light on detail we do not know what form funding would take. Talk of additional superannuation levies is a worry because depending on its implementation it could have regressive distributive effects compared with some kind of progressive levy. With approximately a week to go for members to vote both candidates need to provide more detail on the policy leadership they would provide here – if voters want to make an informed commitment. Bill Shorten drew liberally on the role he played in implementing the NDIS/Disability Care – but would he – or Albanese – support comprehensive and progressively-funded National Aged Care Insurance? Shorten talked of increased support for victims of domestic violence; of real equal pay for women; of flexible childcare. And in addition to pursuing 40% affirmative action for women ALP candidates, he went further – suggesting quotas for queer and indigenous candidates. Though there is the argument that were quotas provided for every important demographic how would this affect the internal democratic process? In addition we could well argue: What room would be left for election of candidates by rank and file members based on their policy commitments more so than their identity? Were quotas implemented, for instance, what about representation of the poor and the economically under-privileged? One option would be not to focus purely on the parliament, but on civil society – providing financial support for social movements as part of a strategy to empower the disenfranchised, and promote pluralism and active citizenship for a healthy democracy. Another option could be an emphasis in self-government for the disenfranchised – including indigenous Australians – at a variety of levels. Parliament is not the be all and end all. There were questions directed to the candidates about engaging young people, also, and Shorten spoke again and again about standing up for the “powerless”. But neither candidate drew the conclusion that education for active and informed citizenship, including political literacy – should be part of this process. Shorten also needed to be more specific about the policy ramifications of such a stand. What about reforming Newstart? What about restoring pension rights to Sole Parents, and restoring pension coverage for the disabled? And again: What about National Aged Care Insurance – funded progressively – and ensuring the necessary minimum staff quotas, monitoring a variety of health and quality of life indicators, ensuring more vigorous accountability when it comes to providing quality food, social interaction and so on? What about pleasant surrounds; all the necessary heating and cooling; all the necessary medical/dental care; changes of scenery; and access to Information Technology and books for those who are interested? And what about greater financial and other support for Carers – to assist the aged in staying home as long as they wish to and are capable of? But also incorporating robust social interaction programs – greatly ameliorating one of the greatest challenges the Aged can face – chronic loneliness? Both candidates were short on detail when it came to Aged Care policy. Shorten referred to dental care, for instance: But comprehensive public dental would cost billions. We need to ‘get the job done’ on socialised health, for instance: but we also need to be clear where the money is coming from. Abbott could face this challenge himself when it comes to implementing the NDIS. The candidates spoke of ‘aspiration’: but often this is used as a rationale to abandon distributive justice; or to suppose the pursuit of educational equal opportunity is enough – when there are aged care workers, child care and hospitality workers, cleaners – all working hard for little gain, and not enough respect. Regardless of the ‘aspirational’ Ideology both candidates paid lip service to, many people will not break out of poverty, or will spend their lives in important, dignified working class jobs. These people also need recognition, respect and distributive and social justice. One dyed-in-the-wool Liberal voter asked the candidates at QandA ‘what they would do to win his vote’. He suggested ‘small government’ as one of the issues that motivated him most. But Labor cannot be ‘everything to everyone’. An ageing population and a growing population means the size of government MUST increase if we are to maintain infrastructure, services and quality of life for all. And indeed, programs like Disability Care demonstrate how we must increase the scope of social expenditure to provide all citizens with dignity, happiness and security. Both candidates should be open to expanding recurrent tax-funded social expenditure by perhaps 1.5% of GDP in their first term: or by around $22 billion in a $1.6 trillion economy in today’s terms. Depending on circumstances an even larger commitment may also be desirable. We need to ‘seize the nettle’ to implement the maximum reform program we can sustain; but also to be aware of ‘the art of the possible’. Importantly, Shorten suggested drawing upon superannuation funds to build infrastructure – with guarantees for the funds. The problem with this, though, is that it is in some ways similar to a traditional ‘Public Private Partnership’. And as with many PPPs, despite the rhetoric the people still shoulder the risk. What is more, public finance is still by far the most efficient mechanism. Public infrastructure projects also don’t need to deliver a profit to shareholders! While calls to mobilise superannuation in this way gives the impression of ‘innovative thinking’ – and would benefit union-managed funds - public finance is still the cheapest way of building infrastructure because of the credit rating of governments ; and is still in the public interest because of this. 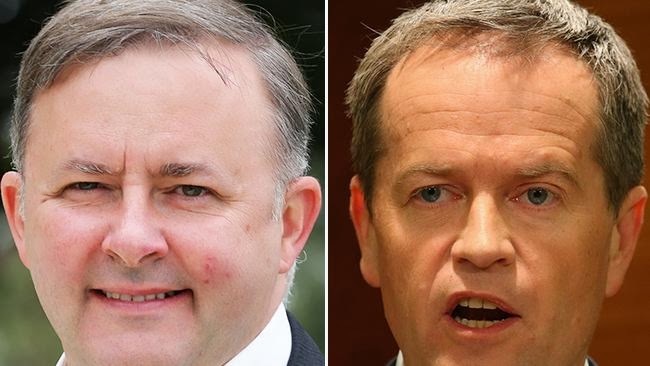 Both Albanese and Shorten appeared uncertain about the position developed under Rudd – that it would take a full 75% of Caucus to replace an elected Prime Minister. Perhaps there should be some room to move, here: though reverting to 50% would effectively nullify the reforms with which we’re concerned here – the contribution of the rank and file in electing the leader. On the down-side, Shorten appeared to be seriously considering US Style Primaries in order to mobilise and include Labor’s electoral base. While this is a noble principle, the apparent mechanism is a worry because of the potential to entrench the power of wealthy fundraisers with ‘big money’; and also divert Labor’s human and financial resources more than is desirable or sustainable. Building Labor into a genuine mass party again – and renewing Labor by attracting younger members - is a seriously challenge if Labor is to survive in the coming decades. BUT MOST IMPORTANTLY: Albanese has come out unequivocally in favour of direct election of ALP National Conference delegates; and much broader involvement of the rank and file in policy development. This could be THE ground-breaking reform which will deliver meaningful power back to the ALP’s rank and file: and in so doing not only further democracy – but also revivify Labor’s previously flagging membership. This is this issue which so far has me tending towards supporting Albanese. I am still waiting for Shorten to match Albanese on this front. And I am waiting for both candidates to say something of greater substance on responding to Aged Care needs. For instance, Albanese mentioned the ageing population as a crucial challenge. But we need specifics on ‘Disability Care’ style National Aged Care Insurance. The debate on the Labor leadership has not been anywhere near as vigorous and wide-ranging as this ALP member had hoped for. Despite some encouraging rhetoric on the role of progressive taxation and the principle of social insurance, neither candidate has been willing to promote ‘signature policies’ in the extension of the social wage and welfare state in areas such as Aged Care. Neither candidate has overtly drawn the conclusion that ‘small government has to go’: not only to respond to an ageing and growing population – but to extend the rights of all Australians – including the unemployed, students and the disabled – but also including all workers. There is also the question whether or not either leader would remain true to their previous rhetoric once in the leadership position. Would Shorten actually back progressive taxation and social insurance extension in the leadership? Or would he succumb to pressure from the Right faction for an ‘electorally safer’ option of continued small government – despite the fact small government CANNOT deliver to the disadvantaged and vulnerable he aspires to stand up for? Would either candidate seek an expansion of the social wage absolutely and relatively: or would they both continue the usual policy of ‘robbing Peter to pay Paul’ on social services and welfare? Again: For this ALP member the current ‘deciding factor’ is Albanese’s support for democratic internal party reform: specifically direct election of National Conference delegates, and much broader – and deeper – involvement of the rank and file in policy development. In addition to this we also need to support an expansion of the size of Conference – and while I am uncertain of the candidates’ positions and that specifically – Albanese’s position on the aforementioned and related issues is impressive for me as a grassroots activist. Albanese was also encouraging by arguing in Melbourne for “the next NBN” and “the next ‘Disability Care Australia’; Yet why was he not more specific? Aged Care is the obvious contender for our attentions over the coming term in Opposition – and to promote a positive agenda for the next Federal election. Indeed - by applying pressure we may even make progress under the Abbott government – If we recall that Abbott gave bipartisan support for the NDIS – quite possibly “to neutralise it as an issue”. “Getting policy done” is what matters most! Albanese also talked in Melbourne about addressing “the urgent necessities of today” and what families were talking about around their own dinner tables. This is part of the picture, certainly – Though sometimes Labor needs to lead debate as well – and put issues ‘on the agenda’ that otherwise would never receive a hearing. But addressing the cost-of-living pressures faced by poor and working class families will require redistributive measures through welfare and the social wage. Ideally it would also involve a rejection of inappropriate privatisations which add to those pressures. Equal opportunity in education requires that we not ‘drop the ball’ on the quality of state secondary education. And we should also be required to see ‘equal opportunity’ beyond the frame of ‘life chances in the labour market’. We need to prepare our young people to be active and informed participants in a democracy; and to develop their capacities to appreciate culture, express themselves and lead fulfilling lives. Shorten says again and again that he wants to stand for the disadvantaged and the powerless. In addition he needs to stand for the average worker! Shorten’s rhetoric is nonetheless encouraging. Though he needs to be more specific on social wage, welfare and social insurance POLICY aspirations if he wants to appeal to potentially-swinging, progressively-inclined ALP rank and file members. Concrete commitments by Shorten on this front – real absolute and relative social wage, social insurance and welfare expansion –could swing many members. As could a clearer stand on the front of internal democratic Party organisational reform. Such perspectives would have this member considering Shorten again. And despite the media rhetoric – sometimes Labor does need to talk about itself. That is, in the sense of putting in place the internal participatory mechanisms that will see us develop the best policy positions we can put to the Australian people. And which will grow Labor as a movement, and lay down deeper roots in workplaces and communities. This is the first chance ALP members have had to contribute to the direct election of the ALP Leader. Let’s hope it’s the first of many important internal reforms that remobilises our movement by empowering the Party’s greatest asset – its Party activists. nb: To see the questions we had sent to Albanese and Shorten earlier pls see the following URL: Unfortunately we did not receive a reply; But I hope readers will find the above consideration of both candidates useful in determining their vote!